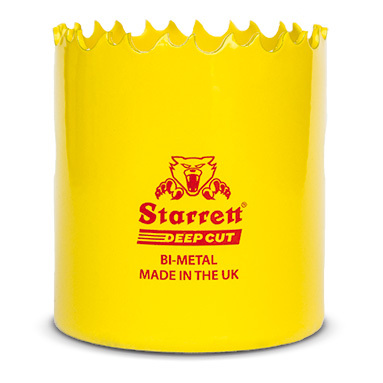 Starrett Deep Cut holesaws combine the tried and tested tooth form of the previous Dual Pitch holesaw, with a new tooth material for enhanced heat and wear resistance. The Starrett Deep Cut bi-metal hole cutter also features an increased hole cutter depth of 51mm (2 inches) and is ideal for cutting metal of more than 3mm thickness, tubes with a wall thickness of greater than 3mm and wood up to 51mm (2 inches) thick. Aggressive material penetration and kerf clearance. Ideal for solid materials or tubes of a wall thickness greater than 3mm. 51mm hole saw depth improves cutting performance on tubes, particularly where there is a need to cut through both sides of the tube. The increased hole saw depth requires arbors with an extended length pilot drill (e.g. A1E, A2E or A17-38E).